Face it: it's weird that the film most associated with Christmas is It's A Wonderful Life. The 70-year-old Frank Capra classic is fantastic, of course, and surprisingly dark: a suicidal protagonist, a trip through the Great Depression and WWII, and an amazing, evil capitalist villain. But aside from evil capitalists, the problems and everyday realities of Capra's America aren't the problems and everyday realities of today. Where are terrorists and high speed car chases? Where are 24-hour news networks obsessed with trivia, or the heaping spoonfuls of fast food clogging our arteries and making us look ever more Santa-like as the years go by? No my friends, as great as It's A Wonderful Life is, it's time to offer it a graceful retirement, lest it become as stale and meaningless as "Here We Come A-wassailing." A-wassailing? Really? That's why this year, I want to give you the greatest gift of all: way cooler '80s cinema classics that could take It's A Wonderful Life's place in popular culture—at least until we need to update again to make the holidays relevant to cyborg aliens. But since that's not likely to happen until at least 2130, meet your new Yuletide overlords. On Christmas Eve, gritty NYPD cop John McClane fights an entire group of pan-European thieves bent on stealing the assets of a humongous Los Angeles corporation. In the process, he wins back his wife, invents an aweseome catch phrase and-thanks to his onscreen chemistry with character actor Reginald Vel Johnson as Sgt. Al Powell—manages to bring Family Matters into existence. Thus, much like the wise men of olde bringing forth the First Noël, Bruce Willis is partly responsible for the birth of Urkel. Sure, an amazing amount of violence isn't the first thing you think of when you say "holiday classic," but bear with me. Two words: Alan Rickman. It's been scientifically proven that he is the greatest living Englishman, but his greatness never feels as immediate as it does when he dons a beard. Die Hard's master criminal Hans Gruber is the definitive Alan Rickman With A Beard, the perfect combination of slick corporate style and scruffy fake leftism. His mastery of an American accent tricks McClain into joining him in a temporary and dangerous alternate universe not unlike the one George Bailey is thrust into when he wishes himself dead, making Hans Gruber Die Hard's Clarence the Angel. Only this time, whenever you hear a church bell, an Angel gets prison stripes. Over the Christmas season, new partners Detectives Riggs (Mel Gibson) and Murtaugh (Danny Glover) bust an arms-smuggling/heroin ring, save Murtaugh's daughter, facilitate a kung fu battle in the rain and shoot up a Christmas tree lot. Plus, Mel manages to avoid saying anything shockingly offensive! I kid, I kid. The real miracle is that it makes Christmas in Los Angeles look frosty, it makes Gary Busey look like a cool character actor, and it gave the world a phrase for when one is getting too old for something. Like Die Hard, Lethal Weapon has prodigious violence and even more swearing. But it also centers around a suicidal protagonist. Mel Gibson's Detective Riggs is a man racked with regret and loss convinced that the world would be better off without him. When he learns that his new partner can't don an '80s mullet while martial arts fighting shirtless, he realizes that the world needed him after all, and his suicidal urges are cured. 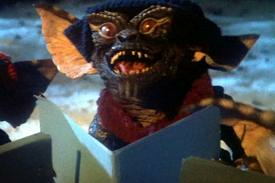 Gremlins made the whole world fall in love with a puppet, the adorable Mogwai named Gizmo. That's miraculous enough, but Gizmo's full of Christmas tricks, like the fact that he reproduces when water is sprayed on him. And that his offspring are guaranteed to be evil. And that if they eat after midnight, they turn into ravenous, vandalizing monsters bent on killing everything they can. Scary! Adorable! Sca-dorable! Luckily, Christmas is saved, just like in real life, in a department store, where the best bargain of all is getting to still be alive in the morning. What if your dad stopped existing? We find out when Phoebe Cates grinds the movie to a halt with her out-of-nowhere monologue about how her father suffocated to death on Christmas while trying to shimmy down a chimney dressed as Santa Claus. And so, in the course of stopping the Gremlins, a teenage girl learns to resolve her lingering grief over the death of her dad, enjoy Christmas (kind of) and learn that it really is a wonderful life after all...so long as it isn't plagued by terrifying monsters from the Far East. Another holiday-themed film about a suicidal protagonist (John Cusack) who has to learn that life is pretty okay with him in it, this absurd '80s comedy is also one of the funniest films ever made. Somehow, constant jokes about suicide are charming, at least as charming as a hot French exchange student's mispronunciation of the word "tentacle." ("You know, like octopus? Testicles?") Plus, it has everything we associate with Christmas: ugly sweaters, unwanted gifts, bored small-town kids and lots of skiiing. "Lane, I've been going to this high school for 7 years. I'm no dummy." Like Clarence the Angel, Curtis Armstrong constantly offers John Cusack advice that's surprisingly good (mainly about where to find mountains of pure snow). It also has a Mr. Potter analogue in the character of ski team captain Roy Stalin, and a touching final scene in which Los Angeles' famous smog problem is barely visible at all! Best of all, Van Halen's "Everybody Wants Some" is tailor-made for the holiday season: it reminds everyone that they need to go shopping for presents, and that Van Halen has really sucked since David Lee Roth left.